The on-demand system for a Hyundai Santa Fe transfer case makes it an integral part of the drive train for Santa Fe SUVs. Borg Warner specializes in manufacturing these transfer cases and the BW4424 is the most common. Finding out what part you need can be tricky if you don’t know how to identify it. We are expert rebuilders of transfer cases for sale and we carry one of the largest inventories of Hyundai drive train systems. The 2.7L, 2.4L and 3.5L engines are the most common and we can supply a direct part that fits without modifications required during installation on an AWD or 4WD system. Finding reliable parts on the aftermarket to work with a Hyundai Santa Fe can be challenging. 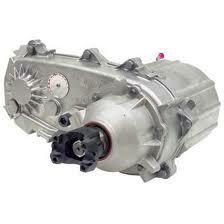 Specialty part dealers do not stock the complete transfer case and only sell motors or rebuild kits. When you need a completely rebuilt transfer case, you have the option of buying one from a junk dealer or getting something that will last for another 50,000 miles or more with no signs of problems. We are professional rebuilders that know the Santa Fe and how complex the electronic shift technology is that is used inside of the transfer case. We sell expertly rebuilt transfer cases that carry our seal of approval for craftsmanship and usability. What does a rebuild kit give you? Not much. These kits are nothing like a completely reconditioned unit. If you have a problem with the linkage, you must have a new chain installed to give a Santa Fe the stability it needs for its intended gear ratio. What about bearings and seals? You will get them here but not anyplace else. A blown bearing is the cause of many slipped transfer cases. The electronic controls inside can even ignite into flames if a bearing goes out and fluid is leaking. We put the extra time required into rebuilding each bearing and seal. Our Hyundai mechanics finish the rebuild and would put anything we have rebuilt up against a brand new Borg Warner 4424. We are passionate people that absolutely love to rebuild drive train systems. We have a technologically renovated facility and have invested into the proper tools and testing equipment required to make a used transfer case great again. We never sell what we cannot verify and we are known in the industry for putting our reputation first and not profits. The quality of every rebuilt transfer case that we put out is backed by our warranty. We don’t sell units with leaking or blown gaskets. What you pay for is a completely rebuilt unit that is guaranteed to be ready for installation in your Santa Fe SUV. We provide dual ways to receive our lowest pricing. Call us at (888)-508-7153 if you want hear about our price over the phone. We never hassle you and you only need about a minute of your valuable time. If you aren’t a talker, put your information into our Santa Fe quote form and we’ll send over our price to you. You won’t have to search anymore for a Hyundai transfer case online.